At Coding Club the children learn computational thinking, the basics of computer programming and digital skills. They also learn to collaborate with each other in a fun and friendly environment. Create stories and games in Scratch. Learn to think like a computer programmer. Share your games and have fun with your friends. The children will use the Scratch programming language to create their own games and stories. 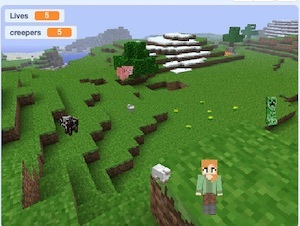 This term’s theme is Minecraft. Year 5’s and Year 6’s will also use the iPads to make Apps. The club is suitable for beginners and more advanced coders. Pick up a registration form from the school office. Spaces are limited.